Be the first to share your favorite memory, photo or story of Gaylon. This memorial page is dedicated for family, friends and future generations to celebrate the life of their loved one. 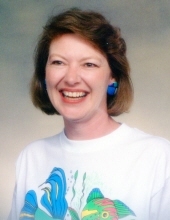 Gaylon Jolene Compton, 67, of Midwest City, died January 26, 2019, at her residence surrounded by family and a team of dedicated hospice professionals. She was born March 10, 1951, in Hartselle, Alabama, to Bill and Grace Lorance. She cherished the relationships she built over the years with family, friends, neighbors, and everyone she encountered throughout her life. Gaylon was preceded in death by her parents; two brothers, Jerry and Bruce Lorance; and, sister, Beverly York. Gaylon is survived by her children, Bob and Donna Compton, and Bill Compton; her sister, Sharon Gerstman; and her brother, Ken Lorance; plus many nieces and nephews - Shonna, Willy and Crystal, Jason and Stephanie, Sharla and Wes, Jon and Jennifer, Amy, Lori, Michael, Brian, and Vicky. She also left behind dear friends, neighbors, and two dogs who meant the world to her, Bonnie and Clyde. A memorial service will be held to celebrate Gaylon’s life at 3 p.m., Friday, February 1, 2019 at Barnes Friederich Funeral Home in Midwest City. To send flowers or a remembrance gift to the family of Gaylon Jolene Compton, please visit our Tribute Store. "Email Address" would like to share the life celebration of Gaylon Jolene Compton. Click on the "link" to go to share a favorite memory or leave a condolence message for the family.